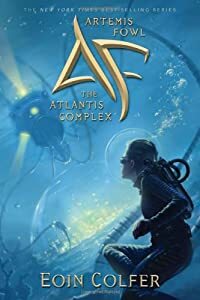 I decided to do mini-reviews for two books at a time, starting with two science-fiction young adult novels: A Wizard of Mars by Diane Duane and Artemis Fowl: The Atlantis Complex by Eoin Colfer. 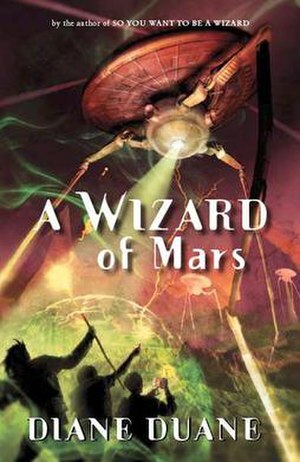 This ninth installment in Duane’s Young Wizard series, published in 2010, takes teenage wizards Nita and Kit back to Mars to learn about the planet’s alien species. Unfortunately, they’re caught up in a galactic conflict which could destroy Earth in the process. Although it seemed like Duane did her research on the red planet extremely well, I’m getting tired of this series. I’ve been reading it since middle school, but it began in 1983, and many of the novels seem to take the form of “filler” stories. Duane herself has admitted that she sees no end in sight, and writes as she goes. So what started out as magical has become stale and without purpose. However, I still love these characters and hope that Nita and Kit get a real romance going soon. Maybe a bit of outlining on the author’s part will give this series the structure it so desperately needs and will maintain my attention span for a few more years. This seventh and penultimate novel in Eoin Colfer’s series, also published in 2010, hit a new low. 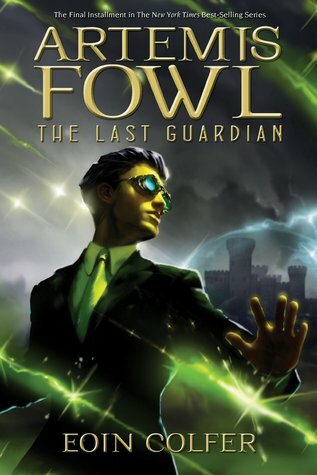 I have loved this tale of boy genius Artemis Fowl, but now this boy is a teenager suffering from “the Atlantis Complex,” a psychological fairy syndrome with symptoms such as OCD and split personalities. He creates an alter ego called “Orion,” who is a flamboyant, obnoxious character with Don Quixote-esque delusions of adventure and romance. Meanwhile, Butler and Juliet fight luchadores in Mexico, and Turnball Root concocts a scheme to save his aging human wife Leonor. Overall, this novel suffers from the same staleness as A Wizard of Mars, but thankfully the final book–The Last Guardian–will be released sometime next year. I wish Colfer would ditch his overly moral storyline on global warming and return to us the mischievous Artemis we all fell in love with, but I highly doubt that’ll happen. So these two science-fiction novels, although drastically different in subject matter and writing style, fell victim to the same weakness of becoming tiring after so many years into their respective sagas. But if you’ve been a fan of Duane or Colfer, I trust you’ll be following them to the very end. I finally reached my goal of reading 20 books this year! And what a novel to end on! Like most bookworms, I had heard of Orson Scott Card’s novel Ender’s Game. I’m more of a fantasy fan than a sci-fi one, but I was intrigued by a book many called the best sci-fi fiction ever. And although I haven’t read enough sci-fi to make that claim, it was a pretty outstanding read. 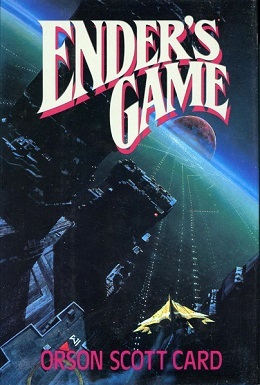 Originally written as a short story but published as a novel in 1985, Ender’s Game is the first installment in the prolific “Enderverse.” The novel follows the journey of Andrew “Ender” Wiggin, a six-year-old genius who’s recruited by the government to join the Battle School, which is a space station used to train gifted children as galactic soldiers. In this distant future, Earth has been in two wars with the insect-like alien race known as the Buggers. Now the planet is preparing their third invasion to defeat the Buggers once and for all. Ender leaves his beloved sister Valentine and cruel brother Peter to spend years excelling up the military totem pole. Of course, none of this training is without consequences. His commanders isolate Ender from making close friends and submit him to grueling practices with absolutely no care for his psyche. Every time Ender believes he’s one step closer to freedom, they beat him down again. He soon suffers from bloodthirst and the incessant need to win at all costs; this in turn brings about many PTSD symptoms, such as rage, depression, illness, and nightmares. What I loved most about Ender’s Game was that it did not rely heavily on sci-fi jargon and overly complicated world creation. You don’t need to be an expert on space travel to understand this story, which is more about Ender’s struggle to maintain his humanity while being molded into an emotionless robot whose sole purpose is to destroy (hence his nickname: Ender, one who ends). Despite your personal views on war and the military, you can learn from this novel. You pity Ender, hate the adults pulling his strings, but most importantly you come to realize the other’s perspective in battle. For once, you see the aliens not as ruthless monsters (a la “War of the Worlds”), but as sentient beings simply lost in miscommunication. I also loved all the symbolism, from the computer game taking Ender from the Giant to the playground to the “End of the World,” as well as Ender’s siblings working together as online demagogues under the aliases “Locke” and “Demosthenes.” I was surprised to hear earlier this year that many of my students were reading this book in high school, but now I agree that teenagers could learn a lot from this rich piece of literature. Thanks to everybody who recommended this novel, and I’ll be sure to check out its sequels in the new year! And if you’ve been following my blog in the last week, you know that I’m not a religious person, but I want to wish all of you a Merry Christmas, Hanukkah, Kwanzaa, Winter Solstice, Saturnalia, and just a happy weekend with your loved ones. And, of course, a happy new year filled with many, many books!